What Roadblocks Stand in the Way of a Digital K-12 Market? 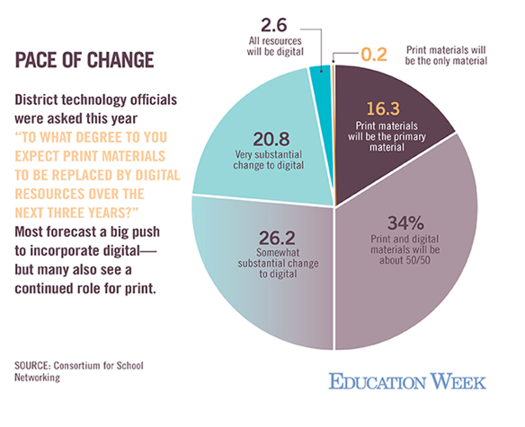 The transition from print to digital resources has been playing out unevenly across districts, with some school systems pressing ahead full-bore and others staying more entrenched in the paper-bound world, either by choice or necessity. So what are some of the factors that are impeding schools’ movement into the digital space? MDR, a market-research company, attempts to bring clarity to that question in a new report: “The Shift Toward Digital: Forcing Factors, Benefits, and Barriers.” It was written by Geoffrey Fletcher, a private consultant who’s a former deputy executive director of the State Educational Technology Directors Association. The report is available at a cost, but MDR is allowing Education Week to draw some of the highlights. Teachers’ lack of comfort with technology. This probably isn’t surprising. But the report says evidence suggests much of the professional development offered to help teachers use technology probably isn’t adequate. Polls show it leaves teachers dissatisfied; much of it is provided internally, perhaps cutting off educators’ access to other good options for training. Districts’ interest in digital content is deeply connected to their interest in “personalizing” lessons to meet students’ needs, MDR points out. But worries about whether student data is being compromised has created fears in districts about moving to adopt new technologies. Some companies are doing little to acknowedge or assuage those fears. Too many states and districts adhere to a purchasing process that is print-centric, MDR argues. In some cases, digitial content providers rely on “subscription” models, which can be difficult for districts to manage, in terms of knowing when they renew. Too much of the digital content teachers and others rely on isn’t adequately tagged, which limits the ability of educators to find it. Tagging is especially important when educators are looking for content tied to a specific standard, skill, or grade level. On the flip-side, several forces are pushing schools into the digital space, notes Fletcher. Among them: improving bandwidth and Wi-Fi capabilities; more sophisticated learning-management systems that integrate content from multiple sources; and adjustments to how teachers use instructional time, which place a bigger focus on using digital tools. For more information on MDR’s findings, see their full report.